The American Southwest is a famously desert landscape. Postcards and movies depict giant cacti, vast sand dunes, towering mountains and cliffs, salt flats, and relentless heat. These things really do exist, but not all in the same place, and there is even more incredible scenery (some ephemeral such as the desert wildflower super blooms that occur following significantly wetter than average winters in the southwest) than you might expect. Seeing all the photo-famous features of the desert takes a road trip in Southern California and Arizona, home of the two major "hot deserts" in America. In general, desert is defined as a climate that receives less than 10 inches of yearly average rainfall and has generally low humidity. A hot desert is one that has very high daytime summer temperatures and occurs at lower latitudes (i.e. further south). A cold desert has cooler average summer temperatures and occurs at higher latitudes (i.e. further north), but still has dry air and low precipitation. An example of a North American cold desert is the Central Basin and range that covers most of Nevada. The quintessential hot deserts occur just south of there. They are the Mojave and Sonoran deserts. This itinerary will show you how to make the most of both in a road trip of just a few weeks. Beginning our trip from the Los Angeles or San Diego area, the first destination is a worthwhile journey to Anza-Borrego State Desert Park. This is in a region of the Sonora known as the Colorado Desert, or "Low Desert" to many Californians. The wilderness of Anza-Borrego is a showcase of flora and fauna from this habitat. While hiking numerous trails and camping under the stars, you can see surprisingly lush palo verde trees, plump barrel cacti, and ocotillo cactus that seems like it would be more at home under the sea. Wildlife includes bighorn sheep, coyotes, kangaroo rats, roadrunners, and quail. Coachella Valley is a well-known example of California's desert. Surrounding the desert cities is an incredible diversity of life and landforms, despite the aridity and heat. Discover the verdant palm oases at Thousand Palms canyon or Hidden palms, or conquer dramatic elevation gradient that leads to pine forests and snow-capped peaks along the Cactus to Clouds Trail. Venturing north of Coachella Valley and up in elevation brings us into a different type of desert--the Mojave. Yucca plants are numerous here, thriving in this climate zone where winter temperatures frequently drop below freezing. The most famous and charismatic yucca variety is the Joshua tree, which thrives among granitic outcrops on this otherworldly landscape. This place is a playground for hiking, camping, and rock climbing. Check out Ryan Mountain, Arch Rock Nature Trail, Keys View, Cottonwood Campground, Jumbo Rocks, and Hidden Valley--just to name a few highlights. Travel east and across the state line and you will enter the fabled land of giant cacti in Arizona's Sonoran Desert. Cutting across the southern part of the state brings us to Tucson, where Saguaro National Park awaits with hiking trails, campgrounds, and petroglyphs among a forest of these iconic and strangely anthropomorphic cacti, all set against a backdrop of craggy mountains. The Phoenix Valley, though dominated by a metropolis, is a beautiful area that deserves more than just a drive-by. The city is worth exploring, as is the landscape. Go for a hike up Camelback Mountain, Piestewa Peak, or South Mountain to take it all in. During the summer, these hikes are best done at night to avoid the heat, and to watch the city glisten far below. You've been waiting for it, and here it is, the largest sand dune field in the Southwest deserts. We reach Kelso by returning to California and back into the Mojave Desert. Along the drive, cacti mostly disappear, while yucca, creosote, and sagebrush return, and the sands take over. One big dune at Kelso rises to more than 600 feet above ground level, and many others are nearly as tall. You can hike on the dunes and feel suddenly swept to a different continent. The final destination in our desert tour is the hottest, driest, and lowest-elevation place of them all, and of anywhere in North America in fact. Part of Death Valley drops to more than 200 feet below sea level, and the surrounding flatlands are a boggling expanse of sand, salt flats, and parched earth. Even here, however, a surprising amount of life does thrive. You can find trees, wildflowers, and numerous animals, even fish, that cling to life in the desert by exploring the Salt Creek Trail and Mesquite Flat Sand Dunes. Witness unique geology at Devil's Golf Course, Artist's Palette, and the famous "sailing stones" at The Racetrack. Camping is the best way to experience the environment in full, witnessing ever-changing light, temperatures, and life cycles of the desert. With so much to see in and around Death Valley, you may want to plan extra time here to top off your ultimate tour of the desert Southwest. Before you go: This trip requires preparation. Roads through the desert can be long and remote, far from services and cell phone range. Plan your route carefully and be sure to pack all necessary supplies. 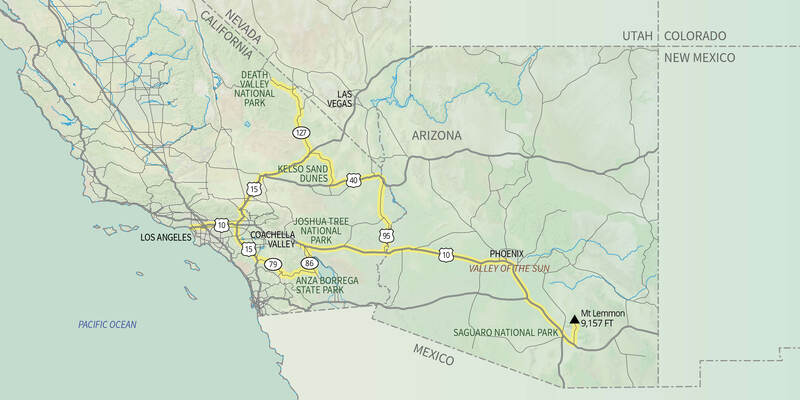 Side trips from the highway may require unpaved roads, which are of variable condition and can quickly become impassable after sudden rain storms. Also, don't be mislead by the term "hot" desert. Nighttime can be chilly, and winter can be brutally cold. Sudden downpours or snowstorms can occur depending on the time of year. The desert is beautiful but powerful, and sometimes unpredictable.